Is your company growing? Are your customers taking longer to pay? If you answered yes to either of those two questions then your company is a perfect candidate for our invoice factoring services. Stop waiting 30, 60, 90 or more days to collect on your invoices. With our invoice factoring services you can get paid in as little as four hours. Invoice factoring is more affordable than you think. 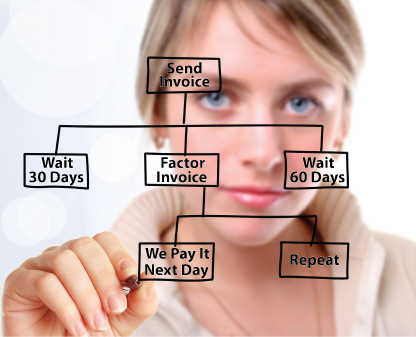 Call the company invoice factoring specialists today and let us help your cash flow tomorrow. We look forward to helping your company with all their invoice factoring needs. Stop Waiting 30, 60 or 90 days for payment – Receive Payment Next Day! You provide delivery of the goods and/or services to your customer. The Bank collects the invoice and pay you the remaining balance less their small fee. Get a quote today and get paid tomorrow!